What Are The Health Benefits Of Whole30 Diet? The Whole30 diet was developed by a husband-and-wife duo, Dallas and Melissa Hartwig, who work as sports nutritionists in Salt Lake City. The diet lasts 30 days and is intended to “reset” the metabolism of the human body as well as detoxify it through various processes. Weight loss programs incorporate specific diets with a pre-determined goal. Popular weight loss plans are the Atkins Diet, Mediterranean Diet, Vegan Diet, and the South Beach Diet. The Whole30 Diet has been around since 2009 and has become much popular after 2014. The Whole30 diet was developed by a husband-and-wife duo, Dallas and Melissa Hartwig, who work as sports nutritionists in Salt Lake City. The diet lasts 30 days and is intended to “reset” the metabolism of the human body as well as detoxify it through various processes. The Whole30 diet is popular among people who prefer to follow paleo diets. Paleo diets exclude heavily processed foods and food items that were not available before the urbanization period and the development of food processing techniques. According to the Whole30 diet, the foods that can be eaten are fruits and vegetables, meat, seafood, eggs, and “good body fat.” Processed foods, dairy products, pinto beans, legumes, white potatoes, tofu, soy spices, and cereals such as barley, wheat, oats, and quinoa are prohibited. Consumption of alcohol is not allowed. Basically, the Whole30 diet is a high-protein diet that involves no sugars and very little amounts of starch. Clean diet: Since processed food is prohibited, the food that one eats while one is on the Whole30 diet is clean – free of additives, preservatives, or any sort of harmful chemicals. Intake of anti-inflammatory foods: Due to increased consumption of vegetables, nuts, seeds, and fruits, more plant nutrients with anti-inflammatory properties enter the body. This helps fight or keep away diseases. Increased intake of iron: Due to the focus on eating meat, the body is benefited by a higher intake of iron than before. Improved satiety: Due to the increased consumption of proteins and fats, there is an increased feeling of fullness from one meal to another. This reduces the need to snack between meals. Increase in energy levels: Successful Whole30 dieters report an increase in energy levels on following the regime. Improved sleep: Once the Whole30 diet is begun, people have reported better quality of sleep than they previously enjoyed. 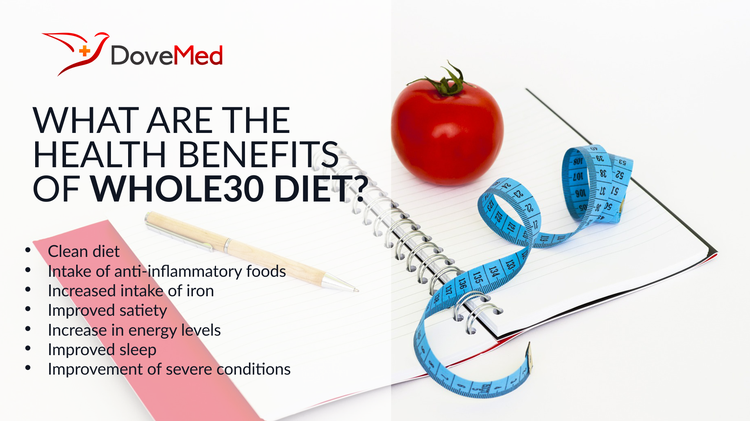 Improvement of severe conditions: People who took the Whole30 diet have reported that symptoms of conditions, such as fibromyalgia, diabetes, and attention deficit hyperactivity disorder improved. The Whole30 diet allows people to see how their food choices are linked to their energy levels, running performance, and overall well-being. According to the makers of the diet, by the removal of major food groups from the diet, the body is given a chance to heal from the damage caused by ‘earlier’ poor food choices. Since different people have different needs, there is no one “perfect” diet. However, the Whole30 diet, with its emphasis on lean meats, is surely worth a try. Hartwig, D., & Hartwig, M. (2012). It Starts with Food: Discover the Whole30 and Change Your Life in Unexpected Ways. Victory Belt. Dollar, U. S. D. U. S. Whole 30 Diet-Does it Live Up to Claims?.